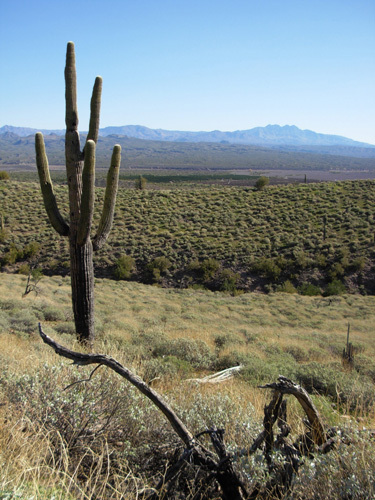 "A stroll through the park may allow visitors to see deer, javelina, birds, and coyotes." 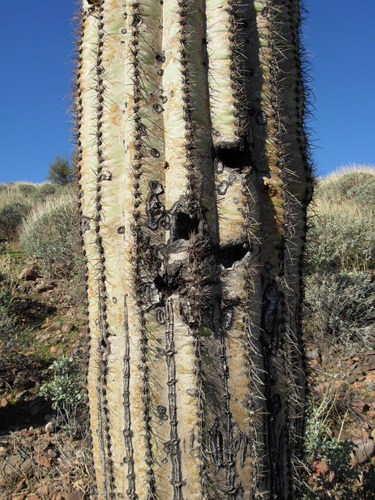 Last year when we camped here at McDowell we had the honor of a close encounter with three javelina. You can see photos here. One bravely ventured quite close to the camper; the other two stayed back 20-30 feet but well within camera range. I'm still hoping to see one or more in the park again this year but that hasn't happened yet. Instead, this seems to be the Year of the Coyote or, more correctly, the season of coyotes for us. We've seen and heard them many times at both Estrella and McDowell Parks since our arrival in the Phoenix area back in December. We occasionally see them in this campground but more often we hear them singing their unique chorus -- at night when we're in bed or during the daytime when we're running, hiking, or cycling on the trails in the northern part of the park. 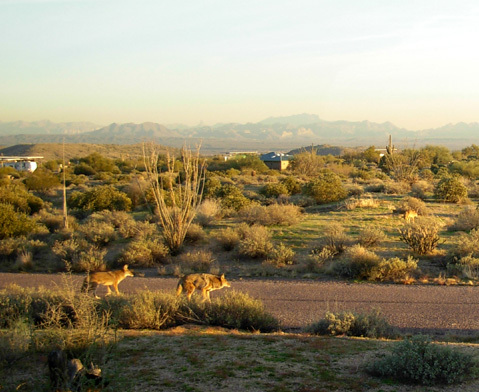 Two coyotes cross the road in front of our camper; another coyote is in the desert at right. Cody's usually alert to their scent or sound but by now he's stopped growling every time he hears or sees them. 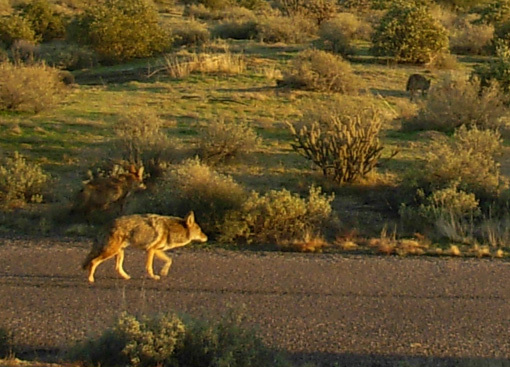 In fact, sometimes when he's lying outside the camper a coyote will pad soundlessly through the desert only a few yards away and he doesn't move a muscle. I don't know if he's losing his sense of smell or he's just so used to them that he ignores them now. He seems to sense that they aren't playful like dogs. I've also seen more long-legged Black-tailed Jackrabbits here this year than last. They move too fast for me to ever get a decent picture of one on the trail or from the camper (I see a lot from the three "bay windows" that surround my computer desk). There are also more common Desert Cotttontail Rabbits that are several inches shorter. 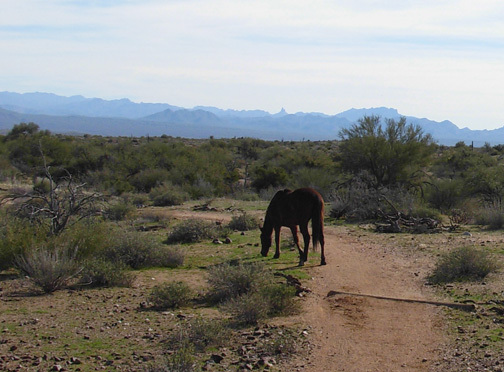 It's common to "run into" horses on the trails at McDowell; equestrians love the place as much as cyclists, runners, and hikers. I've also had the good fortune this year and last to spot several "wild" horses in the park. They aren't like feral horses in the wilds of Wyoming or Montana or on some islands along the East coast. 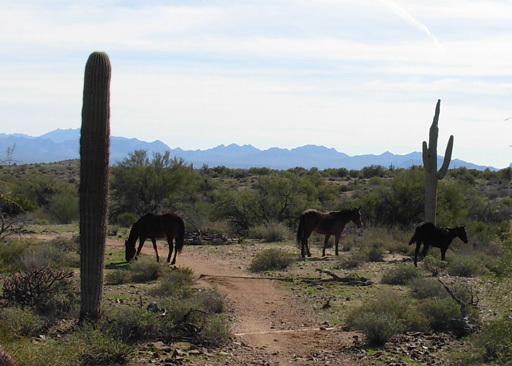 These horses come from private ranches on the east and north side of McDowell Park but they are allowed to wander and forage within the park -- then they apparently meander back home for the night. Blue, red, and yellow flagging (for a bike or foot race?) marks the Pemberton Trail today. 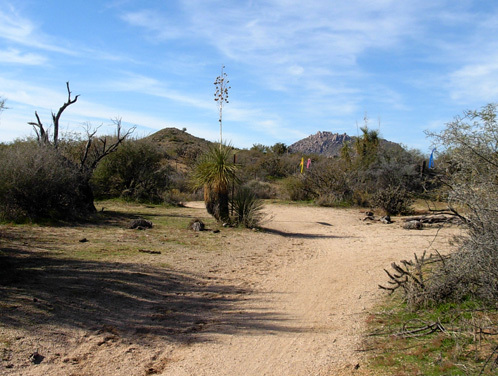 This afternoon I was riding our mountain bike on Pemberton Trail along the north side of the park near Stoneman Wash. I'd already realized (too late) that Sunday is not a good day for a trail cycling newbie like me to be on single-track trail at McDowell. I didn't have any problems on the wider sections of the trail, just the narrow, hilly, rocky ones. There were just too many other cyclists out there on this gorgeous weekend day, mostly young and fast guys with lots of testosterone. Although I enjoyed my long ride it was stressful wondering when one of those hot shots would come whipping around a corner or down a narrow hill toward me. They also liked to come up from behind with no warning so I could move out of their way. They should have been on the competitive track, which is built for speed. When I politely suggested that to one young man he said the Pemberton Trail, which is designed for slower travel by hikers, runners, cyclists, and equestrians, was "more fun to ride" than the competitive track. More fun for whom?? Not for me when I'm paranoid about every curve and hilltop where I can't see who's coming toward me on such a busy day on the trails. I feel more confident riding on trails than I did before this trip but it's still a big learning curve until I develop my skills better. The lesson I learned today is to ride on weekdays when there are fewer cyclists on the trails. Duh. It's more fun to run then, too. 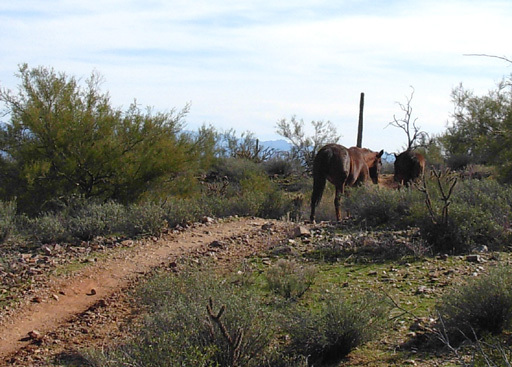 I got off my bike when I saw the horses right up ahead so I wouldn't startle them and so I could get photos. I was able to follow closely enough walking my bike to get several photos before two cyclists came up behind me and rode right through the herd. Grrr. The horses ran off into the desert and I couldn't get any more good shots of them. That was the only time I saw them during this trip. Several days ago I noticed a hummingbird sipping nectar from a flower on a shrub right out the windows surrounding my computer desk. 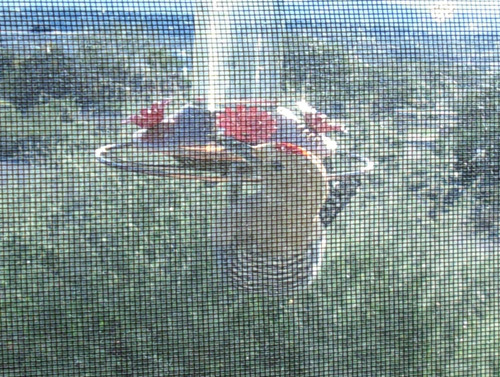 Jim made some nectar as fast as he could and hung one of our hummingbird feeders just outside my window -- about four feet from my face. 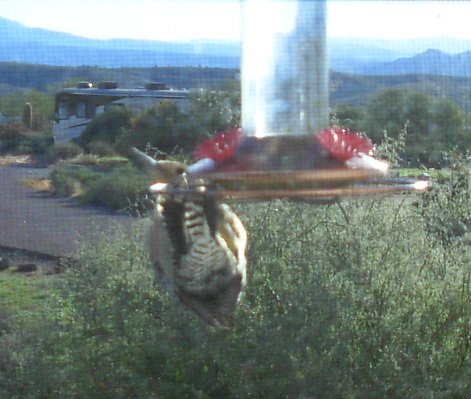 We didn't get much action at the feeder until today, however. 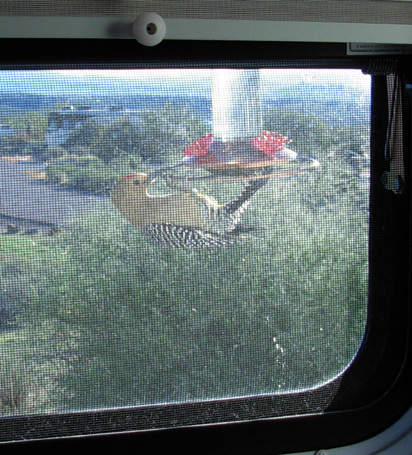 After my bike ride I was working at my desk when I noticed a bird checking out the feeder by flying close several times. Hummingbird feeders are designed for eensy, feather-weight hummingbirds. Their little wings vibrate at a rate of about a gazillion times per second, keeping them aloft so they can feed without landing on the narrow, rounded perch that encircles the bottom of our feeder (you can see it in the next photo). We've seen only one hummingbird, the Juice Nazi (a take-off on Seinfeld's Soup Nazi), wrap its tiny feet around the tubing and sit there to feed or claim the feeder as his and his alone. When other birds came close, he'd swoop out at them to drive them away, then go sit on the metal ring again. Comical for a day or two, then we really felt sorry for the other hummers that were too intimidated to feed. But I digress. 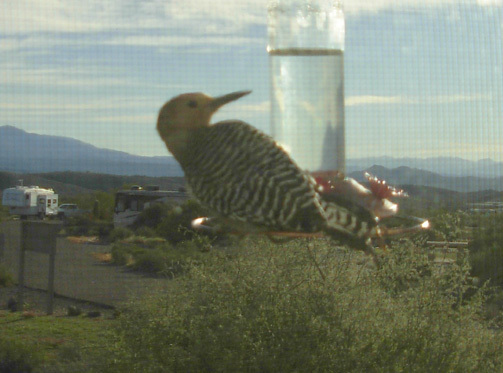 Hummingbird feeders are designed to discourage other visitors so it was particularly entertaining this afternoon when a gorgeous male red-capped Gila Woodpecker came to feed. He may have smelled the sugar water and got curious or perhaps he deliberately sought out a hummingbird feeder because he's learned to steal food from them before. Pretty boy: bright red cap on head, striking black and white stripes on wings. He can't insert his beak into the "flower" until he's upright. 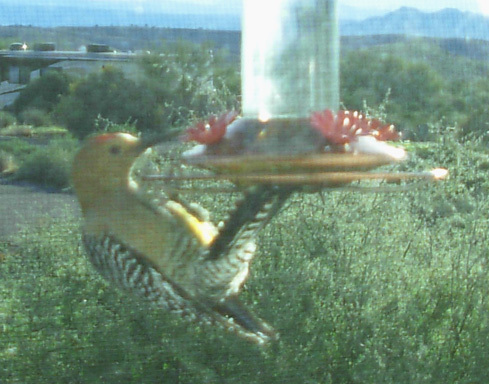 Now woodpeckers can't keep their wings moving fast enough to remain aloft when they feed like hummers do. This guy had to have some solid footing, and that was hard to come by. It was really comical watching him hanging upside down on the metal ring as he tried to get upright. I took a couple dozen pictures of him through the window. Unfortunately the window has a screen so some of the photos aren't as clear as through regular glass. But you get the idea. Poor fella had a tough time gaining a foothold on the narrow, smooth perch but he was one determined bird. 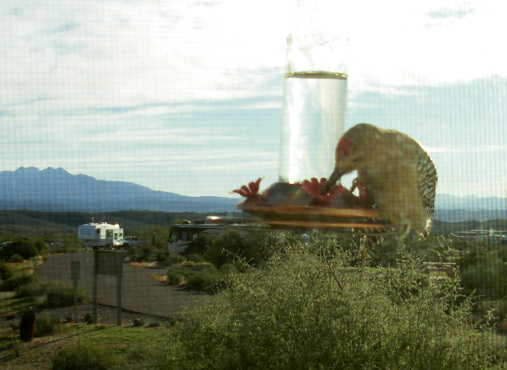 He kept at it for several minutes, twirling the whole feeder as he clung tightly, until he finally was able to stand on the round tubing long enough to get his beak into the little "flowers" where he could get some syrup. Not only did the woodpecker provide Jim and me with entertainment he also served as a lesson in tenacity. Like a good endurance athlete, he simply didn't give up until he accomplished his goal. Well, the first time he did. After taking some long, long sips of nectar he flew off. I saw him return two more times this afternoon but he gave up both times after several minutes of failing to balance correctly on the metal ring. Not so tenacious after all -- probably because he wasn't as hungry the subsequent times and the effort wasn't worth the diminishing reward. Or maybe I'm reading too many human characteristics into his behavior! I saw several of these distinctive male woodpeckers with their bright red caps at Estrella Park in December but didn't know what they were. I was hoping this fella would return to our feeder but we never saw him again while we were there. We didn't see a lot of hummingbirds this time, either. Most of them may be even farther south for the winter.